In the book Zero to One, Peter Thiel asks readers to consider what views/truths they believe that very few people agree with them on. For me, one such belief is that most sunscreen is not helpful in avoiding skin cancer and may actually increase the chances of it! It’s definitely not a popular opinion, and I’m certainly not encouraging you to not wear sunscreen or to ignore the advice of your doctor. I am, however, encouraging you to do your own research, look at the actual studies, and use common sense when it comes to sun exposure. Sunburn is harmful. But sunscreen isn’t the only way to avoid it. Many sunscreens contain toxic ingredients or endocrine disrupting chemicals that in many cases can actually promote skin cancer growth and free radical production in the body. In fact, in the years since sunscreen use began, skin cancer rates have actually risen, and a 2007 document from the FDA stated that: “The FDA is not aware of data demonstrating that sunscreen use alone helps prevent skin cancer” In fact, many reports show that most sunscreens actually raise skin cancer risk. Even natural, commercially available sunscreens often have toxic ingredients! Check out your favorite brand here! Many sunscreens also contain Oxybenzone, a known hormone disruptor that is not recommended for use on children. Vitamin D= necessary for correct hormone formation. Sunscreen ingredients like Oxybenzone= endocrine disruptors that inhibit correct hormone formation. Starting to see the reason some sunscreens may do more harm than good? Recent research is showing compounds in many types of sunscreen harm ocean life, especially coral. This is because these compounds may awaken dormant viruses in symbiotic algae called zooxanthellae. These Zooxanthellae algae provide food and color to the coral. Sunscreen chemicals cause the dormant viruses in these Zooxanthellae to replicate until the algae host dies. This, in turn, causes the coral to die. Researchers estimate that over 5,000 metric tons of sunscreen wash off of swimmers each year. This “swimmer pollution” threatens a large part of the coral life in the ocean and indirectly many other ocean species as well. Considering many people these days are actually Vitamin D deficient, I personally consider lack of sun exposure to be a much bigger problem than too much sun exposure. Vitamin D deficiency has been linked to many types of cancers including the most deadly types of breast cancer. Lack of Vitamin D has also been linked to problems during pregnancy including pre-eclampsia, gestational diabetes, premature labor, and more. As a society, we’ve literally cut off our nose to spite our face when it comes to sun exposure. To avoid skin cancer, we’ve shunned the sun and the Vitamin D our bodies produce when exposed to the sun. I don’t buy the idea that even moderate sun exposure is harmful when our bodies need Vitamin D and light exposure for so many aspects of health. I personally take Astaxanthin daily to help protect my skin from the inside out (read about why I do this here). In most cases, my approach to sun exposure is to get adequate daily exposure, without getting close to the point of burning. Since most of us don’t work outside these days, it actually takes effort to get daily sun, rather than to avoid it. I certainly don’t slather on the coral-destroying sunscreen in the off chance I might encounter a few stray rays of sunlight, and in fact, I welcome it! In fact, thanks to 23 and Me, I know that I have mutations that make it very difficult to get enough Vitamin D. This puts me at risk for a lot of serious diseases and taking supplements doesn’t work very well to raise my levels. For this reason, my doctor advised me to get adequate vitamin D… from natural sun exposure. In the event that I’m going to be out in the sun for much longer than my skin is used to, it is often easy enough to just put on a hat or shirt to shield my skin. This is the approach that the Environmental Working Group recommends. It is more effective at stopping excess sun exposure, costs less, and doesn’t harm the ocean. A common sense win:win scenario. If I’m going to be in intense sun and can’t easily cover up when I’ve gotten enough sun, I will very occasionally use natural sunscreen. I’m yet to use it this year, and hope not to at all, but I wanted to share my recipe (and best picks for pre-made) so that if you are in the sun for extended periods of time this summer, you have a natural option. 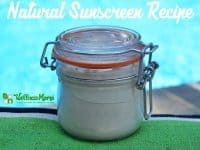 This homemade sunscreen would also be a more natural alternative for really young children, those taking medication that increases sun burn risk, or those who burn very easily. 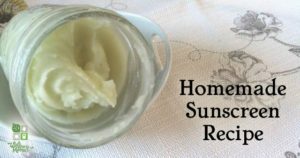 Several recent articles claim that homemade sunscreens are harmful and that a person should never consider making their own sunscreen. Their reasoning is that you can’t verify the SPF with homemade sunscreens so the chance of burning is higher. I certainly agree that homemade sunscreens don’t have the lab testing that conventional ones do, but you know what else they don’t have? Endocrine disruptors and coral killing compounds. Also, sunscreen should be a last resort, according to the EWG, and shade and getting out of the sun are better options anyway. So we shouldn’t use homemade sunscreens in the same way we use conventional. I’d also argue that we shouldn’t use conventional sunscreens in the way we normally do either. Bottom Line: Use common sense and get safe sun exposure. The amount and safety varies by person and I definitely recommend doing your own research and talking to a knowledgeable naturopath to figure out what works best for you. Many of the ingredients in this recipe have a natural SPF (sun protection factor). This is a natural recipe and has not been tested by a regulatory organization for exact SPF. For this reason, I can’t (and don’t) make any claims or even guesses as to the combined SPF. Small mason jars (pint size) are great for this. It will not pump well in a lotion pump! Make sure not to inhale the Zinc Oxide– use a mask if necessary! 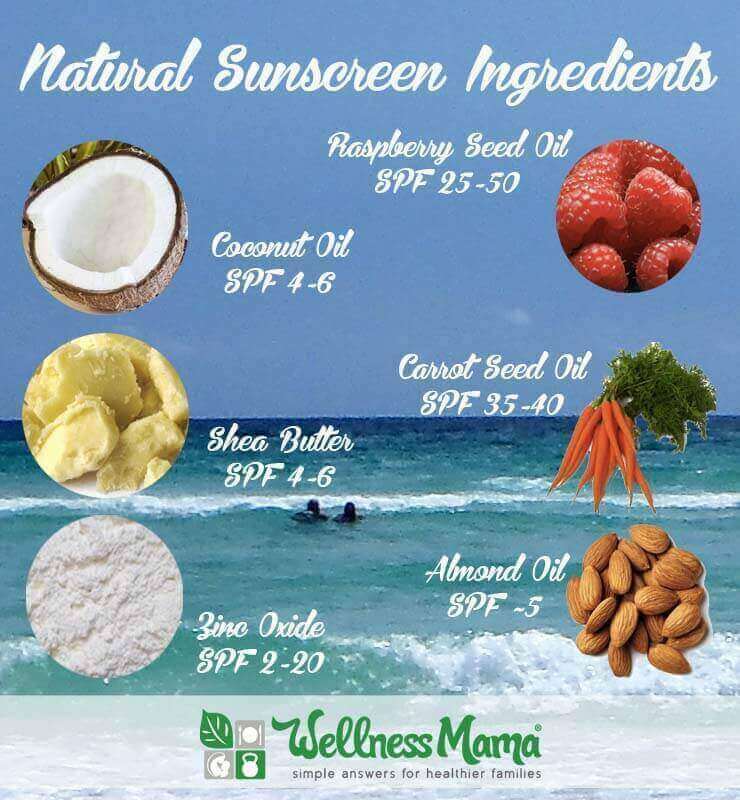 You can also make Sunscreen Bars by using many of the same ingredients and which are easier to apply! What do you think? Avid sunscreen user or Vitamin D junkie?